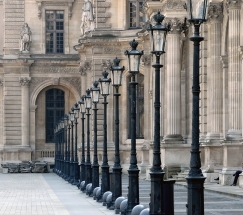 Arguably the capital of culture, Paris is never short on things to do. You could check out the main attractions like the Eiffel Tower and Notre-Dame Cathedral; make a detour via Montmartre and partake in its village feel; take in the current exhibition at the Louvre, the Musée d’Orsay, or the Centre Pompidou; drink in a performance at the Opéra Garnier; take your kids to the Cité des Sciences et de l'Industrie and the Palais de la Découverte and blow their minds; indulge in retail therapy at Paris's department stores; fantasize about the luxurious world of the most prestigious names in French haute couture; or window shop for jewellery at the Place Vendome . . . Or simply break bread with friends or wander aimlessly down city streets and discover some Paris's many mysteries. Where will your next adventure take you? Bright and well-organized apartment with sloped ceilings in the nice neighborhood of Rochechouart. A charming, quiet studio apartment with a small garden in the artsy Montparnasse district. Nice and quiet apartment, in an Arts Deco style, located in “Plaine Monceau”, in the 17th disctrict. Beautiful & modern apartment with a mezzanine, bright and quiet, in Ile Saint-Louis.